The Sunshine Coast is located on the southern coast of British Columbia, Canada, extending 177km (110mi) between the entrance to Desolation Sound on the northwest and Howe Sound on the southeast. The rugged mountains bordering these inlets cut it off from direct road connection to the rest of the province, so although part of the British Columbian mainland, it relies on ferry or air transportation. Welcome to the traditional territories of the Squamish (Skwxwú7mesh), Sechelt (Shíshálh), and Sliammon (Tla’Amin) and Klahoose First Nations. The First Nations people have been on this land since time immemorial. Part of the larger Coast Salish people, they engaged in fishing, hunting, and trade, and were noted for their totem poles, cedar canoes, and unique language. Today, the Coast Salish people continue to contribute culturally and economically to the Sunshine Coast. From artist demonstrations to education about the ecosystems, the First Nations of the Sunshine Coast are ready to share their abundance of history and rich culture. 1800’s – Settlement by Europeans and other non-native peoples began in the 1880’s. Fishing and logging were the main occupations of the settlers, along with small scale farming mostly for their own subsistence. The establishment of logging camps in the Powell River area in the 1880’s was a precursor to greater economic developments. The naming of “The Sunshine Coast” originated with a pioneer family: the Roberts of Roberts Creek. In 1914, Harry Roberts painted “The Sunshine Belt” name on the side of the freight house on the first wharf built in Roberts Creek, and the name was apparently used to promote Roberts Creek as a summer resort destination. When the Black Ball Ferries started a car ferry service to the coast in 1951 they started using the term “Sunshine Coast” to promote the whole area and the name quickly caught on. 1900’s – Between 1910 and 1912 the pulp and paper mill in Powell River was built on the waterfront by the Brooks, Scanlon and O’Brien Company. By 1930 the mill employed more than 2,000 workers, and had become the largest newsprint mill in the world .The development of the highway – which reached Pender Harbour in the 1930s and the northwest end of the Sechelt Peninsula in the 1950s – brought the settlements closer together and, after car ferry service began in 1951, closer to Vancouver. Subsequently, the population increased rapidly. Powell River Townsite was designated as a National Historic District of Canada in 1995 – one of only seven in Canada. A charming community remarkably intact, it boasts over 400 original buildings contained within the borders of the 1910 town plan. Sunshine Coast Today – With a population of just over 50,000 people the Sunshine Coast is a modern hub, yet retains its rich heritage. Forestry continues to be one of the region’s historic economic mainstays, with tourism and the cultural arts gaining ground as emerging sectors, along with fishing, aquaculture, retail and technological sectors. Mining is significant as well, with the largest open pit sand and gravel mine operating in Sechelt. Howe Sound Pulp and Paper in Port Mellon – producers of wood-fibre based paper for the past century – is BC’s longest running pulp and paper mill. Local entrepreneurs have captured the attention of Canadian and International markets. Hapi Foods locally produces their popular Holy Crap cereal, and SideStix are leaders in durable medical equipment specializing in forearm crutches. These are just two examples of successful entrepreneurs that call the Sunshine Coast home. 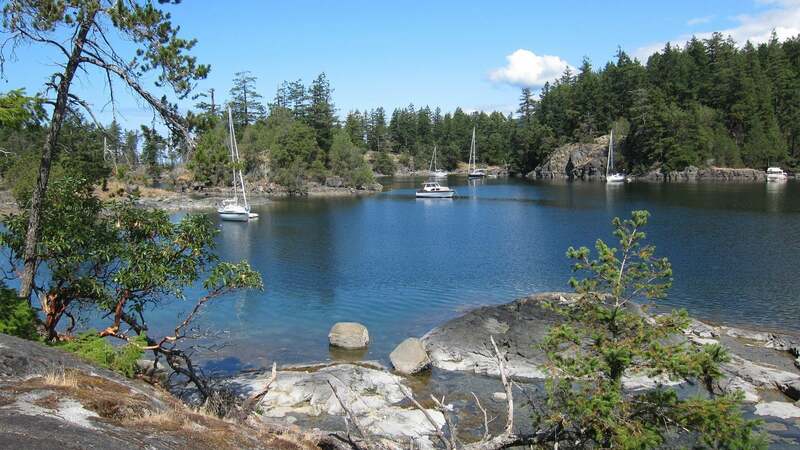 The Sunshine Coast area climate is characterized by mild, moist winters and warm, dry summers. Temperatures on the Coast can range from a damp cold and wet 0C (32F) in winter to highs of 30C (90F) in summer. The annual rainfall is approximately 100cm (40in.) The Sunshine Coast remains sheltered from the open Pacific. Winters on the Sunshine Coast are mild enough that it’s possible to snowshoe on the Knuckleheads or Dakota Ridge in the morning and golf the very same afternoon. Depending on the activities you have planned and time of year, we recommend packing the following basics: bring layered clothing, t-shirt, sweater, rain jacket, comfortable shoes/boots, hat, sunscreen, and casual evening clothing and shoes.